As a parent who has dutifully combed nits from my children’s hair, the promise of a no-comb treatment for head lice sounds mighty appealing. The FDA approved ivermectin for head lice in February 2012. That decision was based on two trials that included a total of 765 adults and children older than six months. The results are finally being published in the NEJM. Both were randomized, double-blind, placebo-controlled trials. That means people with head lice, or their caregivers, were given a coded 4-ounce tube to use. Neither the doctor nor the recipient knew if the tube contained ivermectin or placebo. 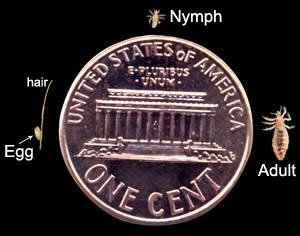 CDC photo of the stages of the life of a head louse, with a penny for size comparison. On day two, 95% of those who used the ivermectin lotion were louse free, compared to 31% of those who used the placebo lotion. On day 15, the score was ivermectin 74%, placebo 18%. Some people in the study experienced side effects, which include eye irritation, a burning sensation in the skin, and skin redness. These were slightly less common among those using ivermectin. The trials compared ivermectin with a placebo, not another remedy for head lice known to be effective way of treating head lice and nits. It makes sense that any treatment with an active ingredient would do better than a lotion with no medication at all. Treatment of head lice traditionally calls for the use of an over-the-counter product containing permethrin or pyrethrins as a first salvo against head lice. Shampoos and rinses made with these substances generally work well. Most treatments for head lice need to be used twice, seven to 10 days apart, along with combing wet hair with a fine-toothed comb to remove nits. Some lice are resistant to pyrethrins and permethrin. That’s when it makes sense to turn to stronger prescription drugs, such as ivermectin and spinosad (Natroba). Don’t overlook the value of nit combing. “Combing works,” says Dr. Claire McCarthy, a pediatrician at Harvard-affiliated Boston Children’s Hospital. “It takes patience and perseverance, but not only does it get rid of both live lice and eggs, it’s completely nontoxic and without side effects. That can’t be said of any other treatment for head lice, ivermectin included.” She also recommends checking everyone’s head in the family, adults included, and laundering in hot water sheets, pillowcases, clothing, and anything else that may have come in contact with the heads of those affected. Temperatures above 122 °F kill adult and juvenile lice. The 100% effective no cost guaranteed solution. Lice and their eggs die in heat. Blow dry your kids hair. Step 1. Wet hair to the roots. Blow dry with heat and fan on high. Step 2. Shampoo hair (to remove the dead lice and eggs). Step 3. Blow dry hair again, shake out any remaining dead lice. Step 4. Place all hair brushes and combs in vanity basin. Pour boiling water over hair brushes and combs, this kills lice instantly. (Watch their lifeless bodies float out). Step 5. Wash bed linen in hot water. All you need to do is to wash kids hair every 2-3 days and use the blow dryer. No more lice. No expense. No drama. Lice my get under the sun. This informative ideas that you have been shared, may helps many people. Thank’s for this article. if any hairfall problem may occur?? Brushes or combs should be soaked in boiled water for several minutes before applied to skin. This is great news. This new treatment will help lots of people that have head lice problems. Imagine with only one dose and no combing, the head lice problem will be solved. Wow, nice article. Thanks for this informative post. Very interesting post. I enjoyed the good reading. It also nice to read about a problem I no longer have to worry about now that the kids are all grown up! This discovery will be very helpful for families that are usually overwhelmed when faced with lice.